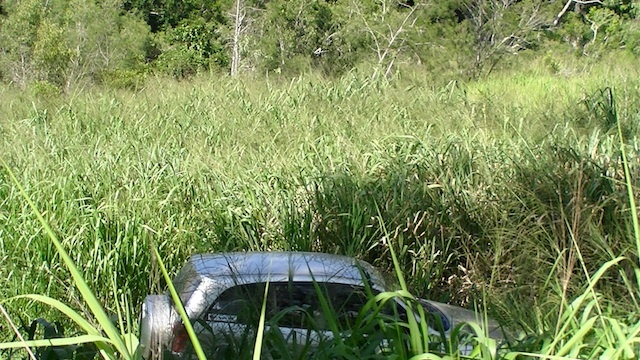 Most of the degenerated sites looked much like the first image of the guinea grass and Rav4 vehicle (for scale). 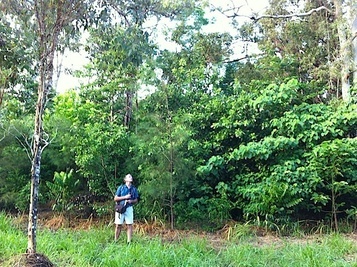 The second image shows tree growth at only two years old with 6 ft person. The rapid growth is due to loamy and rich silt soil and consistent rainfall along the Barron River. Below is a prepared and newly planted site with seedlings and the following image is the same site about four years later. In December 2010, revegetation work had commenced from the Wha Hae crossing. The bird monitoring transect continued 400 m upstream following consecutive plantings. Seedlings grew quickly into trees because of the richly silted soils and good seasonal rain. Photo taken in April 2015.